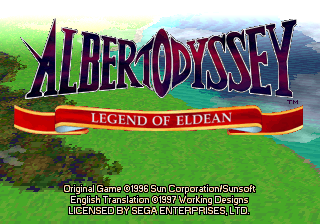 Albert Odyssey: Legend of Eldean, known as Albert Odyssey Gaiden: Legend of Eldean (アルバートオデッセイ外伝 ～レジェンド オブ エルディーン～) in Japan, is an RPG for the Sega Saturn. Main article: Albert Odyssey: Legend of Eldean/Magazine articles. ABSTRACT.TXT TXT (Abstract) 820 About this game. ALB_ABS.TXT TXT (Abstract) 820 About this game.